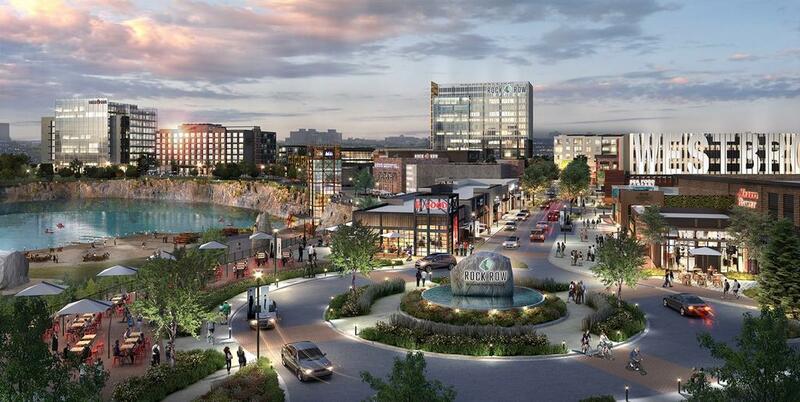 WESTBROOK — The Planning Board has approved the first phase of Waterstone Properties Group’s Rock Row development, paving the way for the group to be before the board next month with Phase 2 plans. The first phase of the project, approved unanimously by the board Tuesday, Sept. 18, calls for the construction of a Market Basket grocery store – scheduled to open next fall – as well as several other retail and commercial space, including a Starbucks and a bank, on the site at Main Street and Larrabee Road. This area of the property would be accessed via an entry road across Main Street from Westbrook Commons and a road off Larrabee Drive. As part of the presentation Tuesday, Wayne Morrill, an engineer with Jones and Beach Engineers, explained the details of the first phase, including building facades, pedestrian and vehicle access, utilities, stormwater management, and landscaping to screen the parking lot and development site, which would include 200 trees, close to 2,000 shrubs and 8,000 flowers, grasses and plants. “We’re spending a large amount of money to make sure this from day one looks like the project that we have we presented to the board,” Morrill said. The next phase is expected to be unveiled to the Planning Board Oct. 2. Set to be constructed in the back corner of the property where Larrabee Road and Westbrook Arterial meet, Phase 2 would include a 8,200-seat outdoor concert venue. Future phases could include 750 residential units; a 12-screen movie theater; 300,000 square feet of office space; two hotels; 100,000 square feet of primary care, specialty care and rehabilitation offices; an outdoor plaza for ice skating or outdoor movies; and a 25,000-square-foot brewplex and food hall. The final build-out probably won’t be done until 2022, Waterstone Principal Josh Levy said. At a board workshop earlier this summer, Levy said the goal of the Rock Row development is simple: create a place where people want to come and spend time. “Our product here is the experience more than anything else,” he said at the time. The plan approved Tuesday is an amendment to one approved in November 2016 when another developer proposed Dirgo Plaza, a retail development anchored by a Wal-Mart. That plan met with public opposition and Waterstone dropped the idea of bringing Wal-Mart in when it purchased the former quarry property in 2017. Morrill said the amended plan “is a lot different than the retail project the board saw the first time. “There are large walkways, a sitting area. This is more of a project that wants you to sit there, walk around and stay there for a long period of time,” he said. Because it spills over into land in Portland, the project needs joint approval from both cities, but the Planning Board waived that requirement Tuesday. Portland is expected to do the same, meaning Westbrook would approve the project and Portland would sign off on it administratively. The city approved a tax-increment financing plan in March that will redirect up to half of the new property tax revenue derived from the development for a 25-year period into nearby infrastructure work, including improvements to the Maine Turnpike interchanges at Exit 47 and Exit 48. The rest of the new property tax revenue would be retained by Waterstone to offset development costs. The Planning Board approved this week the first phase of the years-long Rock Row development process. The second phase is expected to begin being reviewed by the board Oct. 2.